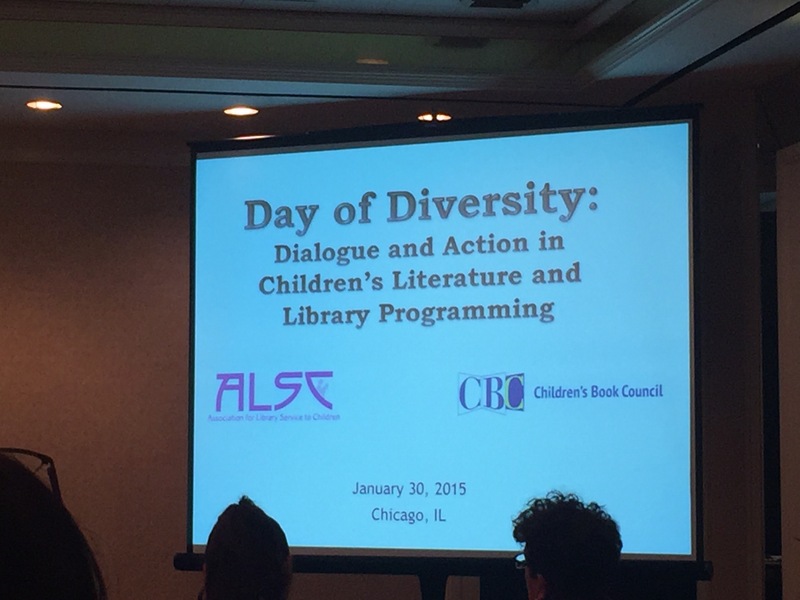 On Friday, January 30, 2015, I participated in ALSC’s Day of Diversity: Dialogue and Action in Children’s Literature and Programming (in collaboration with CBC Diversity). 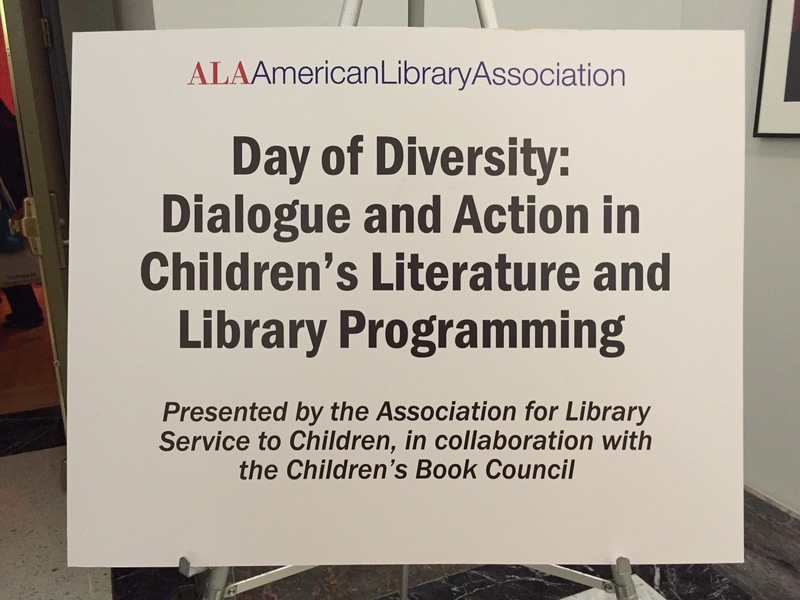 The goal was to “bring together leaders in children’s literature and literacy to discuss strategies for ensuring that all children have access to diverse literature and library programming.” It was an honor to be included among the 70 or so folks who have been working toward equity in children’s literature for years, and in many cases, decades. Also included during the day were 30 librarians who had applied to participate. Some of us were invited to present, some to moderate, some to facilitate, and some to attend. I was invited to facilitate one of the first breakout sessions – our task was to strategize on how to increase diversity in print and digital materials. My co-facilitators were Lesléa Newman, author of Heather Has Two Mommies (which is celebrating its 25th anniversary this March), and Wade Hudson, author, president and CEO of Just Us Books (the only publisher publishing Black-interest children’s books). I’m thankful to have been among so many smart and talented and hard working people. But the one thing that many of us talked about during and after was the absence of particular conversations. We didn’t really talk about power or oppression or dominance or privilege in explicit terms. There was a politeness that was encouraged and for the most part, observed. As the saying goes, “Well behaved women seldom make history” (Ulrich). I’m not saying we should have been rude and out of place, but, invoking another saying, “Power concedes nothing without a demand. It never did and never will” (Douglass). Because the conference program was so carefully crafted, there wasn’t really an opportunity to demand that we talk about power and oppression and dominance and privilege. Sure, there were moments – Violet Harris pointed out that we’ve been having this conversation not for just a year or a few years but for decades; Pat Mora pointed out that the system needs to change; Camila Alire pointed out that the publishing numbers are getting worse… But it wasn’t until the very end, when Satia Orange exhorted us to DO SOMETHING because #BlackLivesMatter. I’m paraphrasing here, but she basically said that the system is not interested in letting diverse voices speak. They want to shut us down because they’re afraid of how things will go down when we’re numerically the majority in 2050. They want to keep us illiterate, voiceless, and powerless, and keeping our stories out of circulation is one way to do that. I wish we had started and ended with something like what Satia said. It was powerful and would have provided the right energy. That said, it was a terrific way to end the conference, and I, for one, walked away feeling even more affirmed that our work matters. Only time will tell what kinds of changes we’ll see in the future. The same cover, below, was used in Dr. Jamie Campbell Naidoo‘s white paper, The Importance of Diversity in Library Programs and Material Collections for Children (ALSC, 2014). 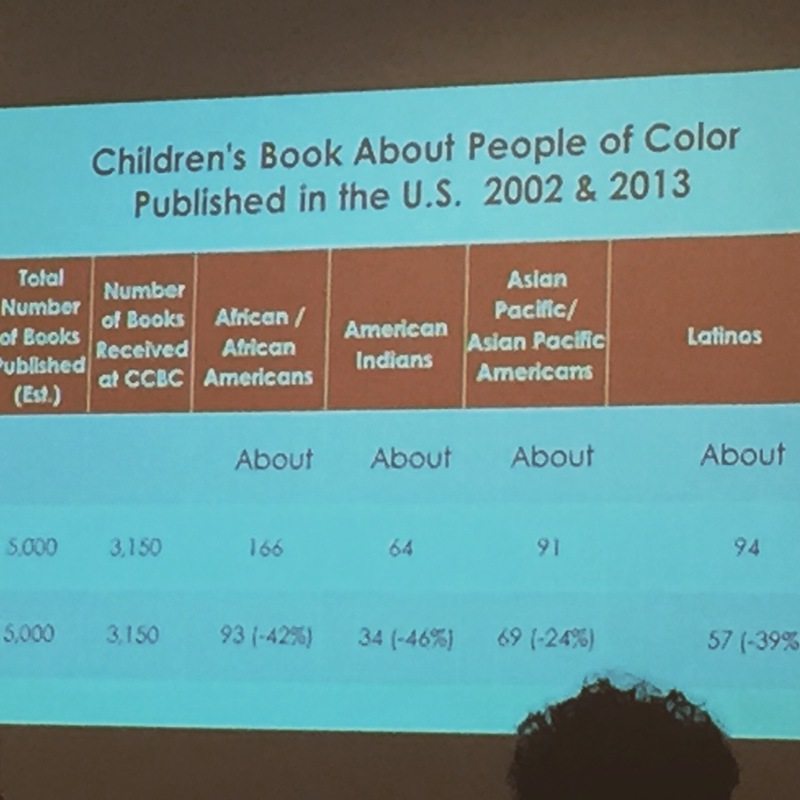 Notice the negatives… the number of diverse children’s books by and about particular populations has actually gone DOWN. Never mind that the CCBC does not evaluate the quality of these books. As Debbie Reese has often pointed out, it’s not enough to have 64 books about American Indians if many of them are horrible books. 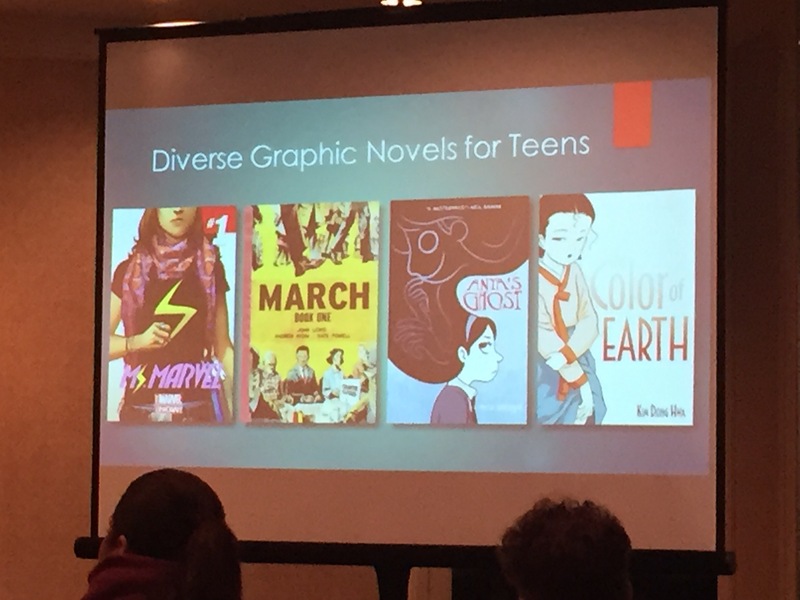 Author/illustrator Gene Luen Yang talked about how these (and many other) graphic novels bust certain myths about non-white people as heroes. Side note: I read The Color of Earth/Water/Heaven trilogy right after giving birth to my daughter, and it was amazing. 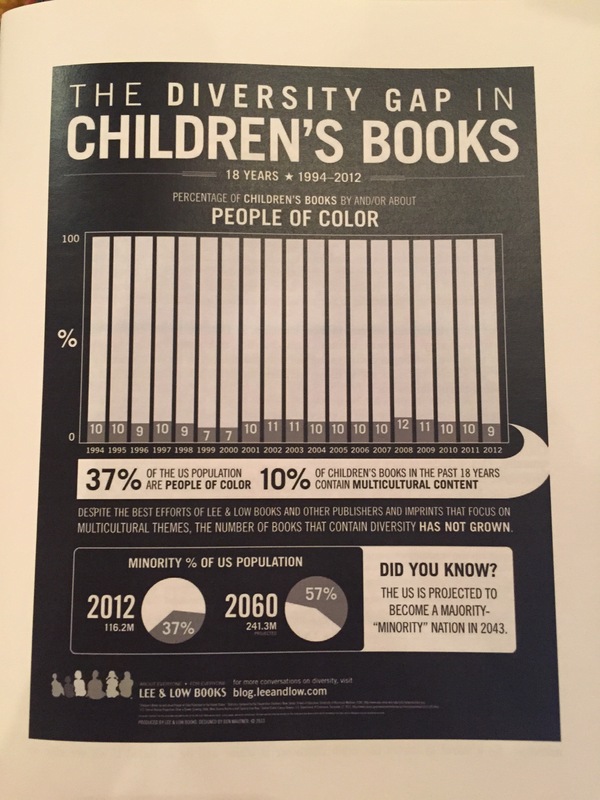 The Diversity Gap infographic created by Lee & Low (part of the “Why Hasn’t the Number of Multicultural Books Increased in 19 Years” blog post from 2013) that so clearly lays out the fact that the number of diverse books has not changed in the past 20 years. Absolutely unacceptable. 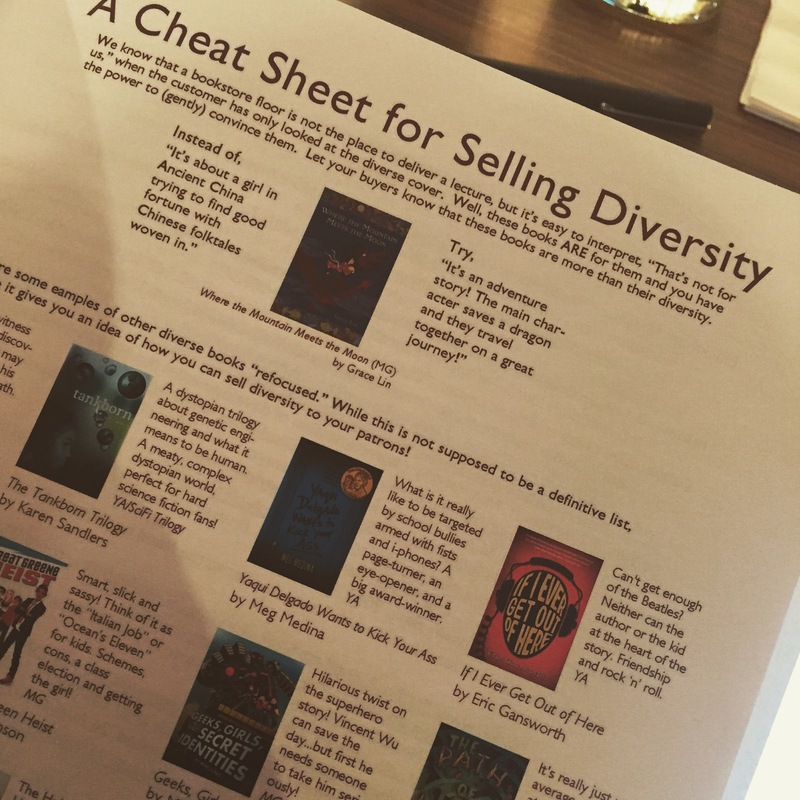 Loved this – a cheat sheet on how to promote diverse books without making your sell about the characters’ race. For example, instead of “This is a book about a Native kid living on a reservation,” say “Can’t get enough of the Beatles? Neither can the author or the kid at the heart of this story. Friendship and rock n’ roll” for Eric Gansworth’s awesome novel, If I Ever Get Out of Here. 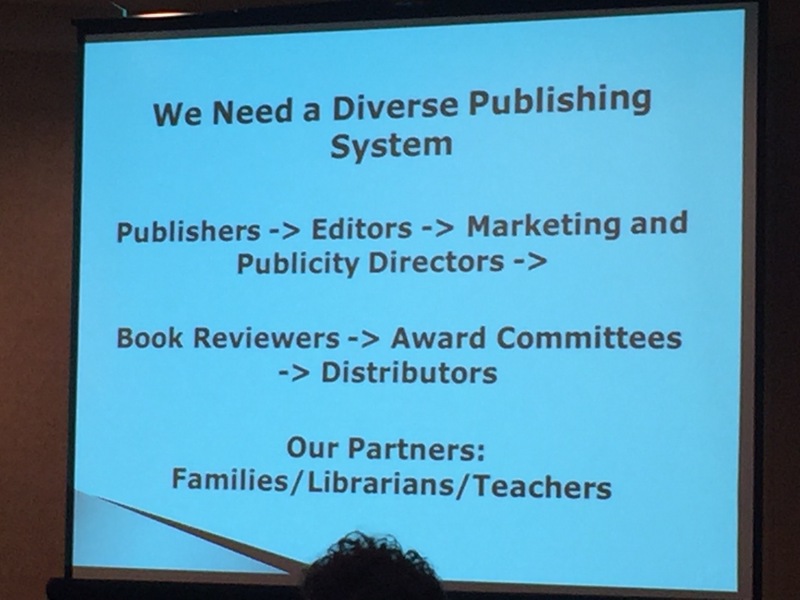 Pat Mora (founder of El día de los niños/El día de los libros – Children’s Day/Book Day) finally just laid it out – we need a diverse publishing system at all levels. 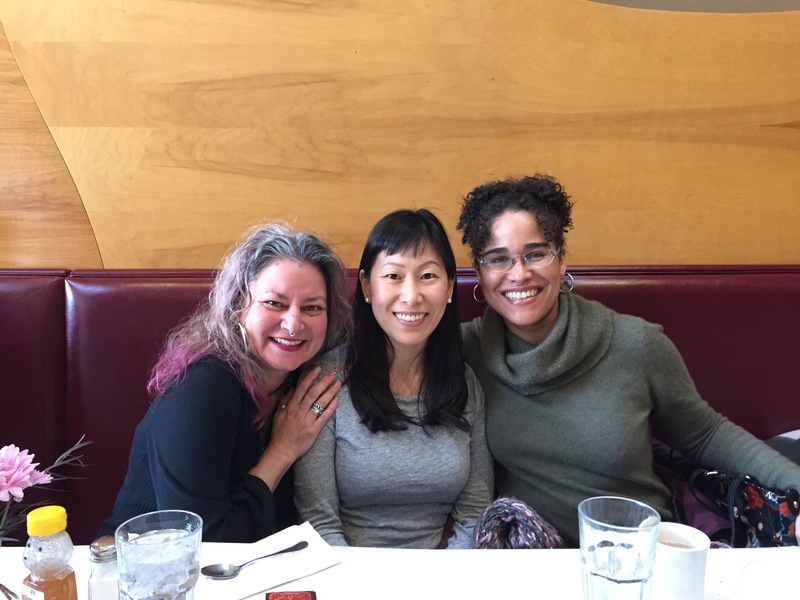 It’s not enough to have diverse books written by diverse authors – they need to be edited by diverse editors (hurray to Namrata Tripathi for embracing her role! ), marketed and promoted by diverse marketing and promoting departments (Remember the time I received a letter from an editor promoting a novel as “foreign” and “exotic”? Yeah, I’d like to forget that happened…), reviewed by diverse reviewers, awarded by diverse award committees, etc. The system has to change at every level. After the conference, we enjoyed a reception at the Harold Washington Library, where Lesléa convinced us all to try a Twix bar that wasn’t a Twix bar and tasted a million times better than a Twix bar. Sandwiched between Debbie Reese and Cynthia Leitich Smith (who is, I believe, one of the most animated and hilarious people I’ve ever met!!) at the We Need Diverse Books dinner. What else is there to say? It was an epic way to end the day. The industry – indeed, the world – can’t ignore the fact that the number of multicultural books has not increased in the past 20 years. It can’t ignore the fact that our society continues to diversify. It can’t ignore that publishing does not. It can’t ignore the fact that there are very talented authors and illustrators who make wonderful and amazing children’s books. 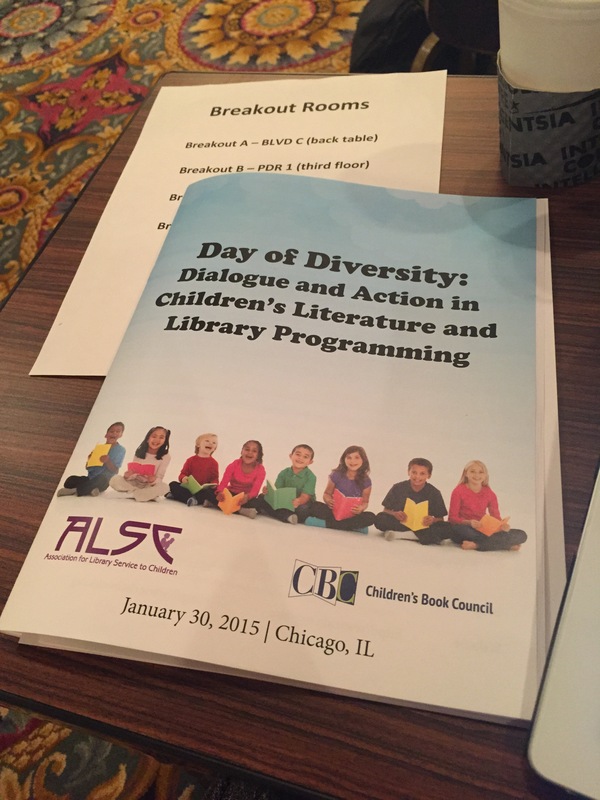 It can’t ignore the fact that a lack of diverse books hurts ALL children. It can’t ignore the fact that we need to have these conversations, that we need to address these issues and talk them out and DO SOMETHING to CHANGE the system. And we can’t do it alone. 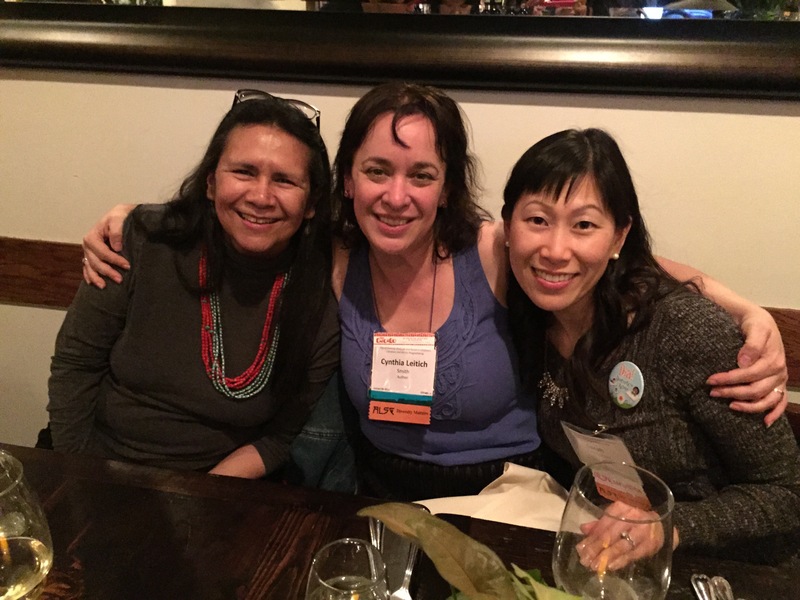 Debbie Reese pointed out that she can’t fight racism re: Native Americans in children’s literature alone. None of us can do the work alone. We all have a stake, and we should all work to dismantle racism and promote equity in children’s literature. Many of us – including those not mentioned here – are already at work, and now, more than ever, we need to STEP IT UP. Won’t you join us?